Pain in the right lower quadrant -- the lower right area of the abdomen -- can arise from a variety of causes. These underlying causes range in severity from minor to potentially life-threatening, possibly requiring emergency surgery. The right lower quadrant contains organs from the digestive, urinary and reproductive systems, along with blood vessels, nerves and other tissues. Abnormalities in any of these organs, structures and tissues can cause pain in the right lower quadrant (RLQ). Digestive system organ abnormalities are the most common cause of RLQ pain. Appendicitis -- swelling and inflammation of the appendix -- heads the list of possible digestive system causes. Diverticulitis, which is inflammation or infection of small pouches along the large intestine, is another possible cause of RLQ pain. Other possible causes include colon cancer and inflammatory bowel disease, including Crohn disease and ulcerative colitis. Meckel diverticulum, an outpouching of the lower intestine, can lead to RLQ pain as well. The urinary system includes the kidneys, ureters and bladder. The right ureter -- the tube through which urine flows from the kidney to the bladder -- passes through the RLQ. Kidney stones may lodge anywhere along the ureter, typically causing intense pain that often radiates to the back. Urinary tract infections can also cause pain in this area, especially if the infection migrates from the bladder to the kidney. Large tumors and cysts of the urinary system are other possible culprits for RLQ pain. They may be noncancerous, as in polycystic kidney disease, or cancerous, as in kidney or bladder cancer. In women, RLQ pain frequently arises from the reproductive system organs, including the uterus, fallopian tubes and ovaries. Ovarian cysts can become twisted or rupture, causing pain. Ectopic pregnancy -- a pregnancy that implants outside the uterus -- causes pain as it grows. If not treated, an ectopic pregnancy may rupture and cause severe pain and life-threatening bleeding. 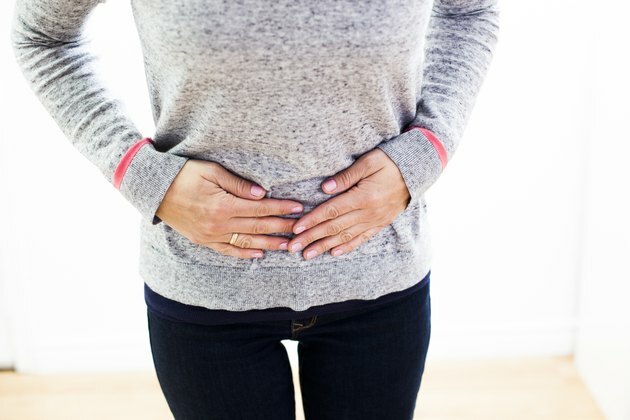 Pelvic inflammatory disease (PID), a bacterial infection of the female reproductive organs, can cause lower abdominal pain as well. Untreated PID can lead to formation of an abscess -- a collection of infected fluid or pus -- with worsening pain. Endometriosis is a painful condition that occurs when cells from the uterine lining grow in various places within the pelvis. Pain associated with endometriosis is usually cyclical, coming and going in relationship to a woman's menstrual cycle. The musculoskeletal system consists of the body's muscles, tendons, ligaments, bones and other connective tissue. RLQ pain may develop from strained muscles after a person engages in vigorous physical activity. The bones of the spine, known as vertebrae, have soft discs between them for cushioning. If these discs bulge and impinge on a nerve, they can trigger pain in the area that the nerve serves. A right-sided hernia -- a condition in which a portion of the bowel protrudes through a defect in the abdominal wall muscles -- may cause fluctuating RLQ pain or severe, constant pain. The cardiovascular system includes the heart, arteries and veins. The body's largest artery, the aorta, courses through the abdomen and splits into two arteries, the common iliac arteries. An aortic aneurysm -- ballooning or enlargement of the aorta -- can lead to RLQ pain. The pain is caused by blood leaking into the wall of the aorta or rupture of the enlarged segment. If the enlarged area extends from the lower aorta to include the right common iliac artery, this may cause pain in the RLQ. A blood clot or temporary decrease in blood supply to the intestinal segments in the RLQ can also cause pain in this area due to a reduction in oxygen delivery to the affected tissues. Rosen's Emergency Medicine: Concepts and Clinical Practice, 8th Edition; John A. Marx, M.D., et al. Andreoli and Carpenter's Cecil Essentials of Medicine, 8th Edition; Thomas E. Andreoli, M.D., et al. Advanced Health Assessment and Clinical Diagnosis in Primary Care, 4th Edition; Joyce E. Dains, Dr.P.H., et al.